The Big Beat Revolution: 11 Essential Songs KEXP's Michele Myers interviews members of the original U.K. scene to find out their favorite songs. 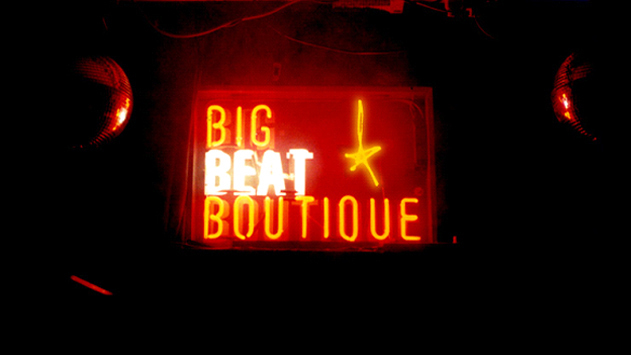 Big Beat took its name from the "Big Beat Boutique," a dance night that Norman Cook, a.k.a. Fatboy Slim, co-founded in 1995. In the early 1990s, when raves had become commonplace in London's underground electronic music scene, a faction of U.K. DJs decided to try something new. Tom Rowlands and Ed Simons, two former ravers known as The Dust Brothers, had mellowed a bit since their all-nighters in Blackburn and taken to DJing in London bars. The duo developed a reputation for packaging hip-hop breakbeats and acid house riffs in a digestible pop-song structure. When Rowlands and Simons were given a residency at a small pub called The Albany, momentum began to build. The evening, run by Heavenly Records and called "The Sunday Social," also included DJ Norman Cook, who later established a similar party in Brighton in 1995 called the Big Beat Boutique. Rowlands and Simons, of course, became The Chemical Brothers, while Norman Cook gained international acclaim as Fatboy Slim. The big-beat-defining duo started producing dance tracks filled with rock-style verse/chorus/verse flows, breakbeat samples and the build/drop format found in house music. London label Wall of Sound and Brighton's Skint Records were at the center of the revolution, with the former releasing singles from Propellerheads, Wiseguys and Les Rythmes Digitales and Brighton's Skint signing Fatboy Slim, Lo Fidelity All-Stars and Bentley Rhythm Ace. Big beat was considered by some in the electronic community to represent a dumbing-down of dance music, though others claim it saved electronic music from wandering off the edges of experimentation. Britain quickly embraced the trend, and the style managed to briefly cross over into the American mainstream. In the list below, originators, producers and DJs pick 11 tracks that defined the London and Brighton sound of the original big beat. The song that really kicked everything off, and made people listen and say 'Right, this is a different sound,' has got to be The Dust Brothers' "Chemical Beats." That record singlehandedly created the sound. It wasn't a totally new concept — the idea was to make a dance record that was slower, because a lot of dance music at that time was quite fast. It was refreshing to hear a breakbeat with an acid riff and a hip-hop influence. It was so simple, it didn't need anything else, just the builds and the drops. When you've got just a drum break and an acid riff kicking off, you've got so much space for all of the sounds to feel massive in the mix. I still love that tune, and I still play it now. LIAM HOWLETT formed THE PRODIGY in 1990 in Braintree, Essex. The quartet went on to become one of the most well-known and commercially successful big beat groups of the '90s. Howlett was a product of the U.K. rave scene and, along with The Chemical Brothers and Fatboy Slim, introduced rave-style warehouse parties to the U.S. This song was there at the start of the Big Beat Boutique at the Concorde in Brighton. I must have danced to it hundreds of times and enjoyed it every single time. It's got all the elements that make up a big beat track. It's all about the breakbeat. Once you've got the breakbeat, it's taking elements of dance music like the 303 lines and sampling elements from house music. But the rhythm track is fundamentally different, because it's based usually on the breakbeat from an old record that's been processed to make it sound more heavy. It's been given a more modern sound by sticking it through a compressor. MARTIN WHITEMAN was an engineer with big beat artists in the early 1990s. As a musician, he played keys with the Lo Fidelity All-Stars, who were on the scene and made several tracks in the big beat style, including "Kasparov's Revenge." We used to do a lottery [for] who would get a chance to play this song, because in a night someone always played it. It's kind of a midtempo track. It was the perfect bridge from faster hip-hop and funk to house tempo. It's such an amazing record. It was quite a hard record, as well. This was before big beat was defined. With ourselves and the people at the Heavenly Social, it was kind of a moment when we realized we were after slightly more uptempo sort of club tracks. There were not enough of these records to play out; that's when we started making records. The dynamics and machismo and funk of hip-hop, the energy and euphoria of acid house, and then [the] sort of dynamics of rock music. Not so much about the grooves you hear in house music. It's more about events. Energetic and in-your-face. DAMIAN HARRIS started Skint Records in 1995. It was one of the two most prominent labels in the original big beat scene. FATBOY SLIM was on the roster, along with BENTLEY RHYTHM ACE and LO FIDELITY ALL-STARS. Harris started the club night Big Beat Boutique with Fatboy Slim in Brighton in '95. When The Chemical Brothers started the Heavenly Social, I was the warm-up DJ for them. We started a club in Brighton so we didn't have to travel to London every weekend, called the Big Beat Boutique, which is where the term "big beat" was coined. If you think that house music is named after the Warehouse club in Chicago, and garage was named after Paradise Garage in New York, big beat was named after the Big Beat Boutique in Brighton. I think a definitive song for me would be The Chemical Brothers' "Brothers Gonna Work It Out." It was sort of the blueprint. It used breakbeats, but it used kind of acid house build-ups and a great sort of pop hook. We cherry-picked the best things from rave and hip-hop. The party side of hip-hop rather than the aggressive side. And the sort of euphoric side of rave, rather than the gnarly side. NORMAN COOK is one of the founding fathers of big beat. As FATBOY SLIM, he released a number of genre-defining singles and four full-length albums. Cook is currently taking a break from recording and enjoying his "fifth wind" as a DJ. In 2011, he's played more than 50 shows this year at parties all over the world. For me, the track that's definitive has got to be Ceasefire's "Trickshot." It was on Wall of Sound. Derek Dahlarge teamed up with Mark Pember (who now goes under the guise of Meat Katie). It had a huge sample from the movie Carlito's Way in it. It's got the big film sample, it's got a classic old funk break sample, big guitars and huge breakbeats going on. I listen back to it now and think, "Man, it's so slow." It's got this downtempo feel, but at the time, post-rave [had gone] to this trip-hop place. But this other force was happening where things were getting put uptempo. People were pitching their breaks up. That tune says it all for me. I remember Jon Carter busting it out on nights we were doing. It seemed to cut through everything and say, "Here I am." WILL WHITE teamed up with partner Alex Gifford to form PROPELLERHEADS in 1995 and release their first EP, Dive, in '96. The duo stood out in the big beat scene for using live instrumentation in their sets. Propellerheads' landmark album, DecksandDrumsandRocknRoll, came out in '98. The big beat thing was kind of seen as happy, uplifting kind of music; it was non-house, using samples from funk tunes or hip-hop tunes. Obviously, house music was really big, and then this was something completely different that wasn't drum-and-bass or house. This music came along, which was this fun music. And this track was a big commercial record, because it had hooky samples on it like Fatboy Slim's "Rockafeller Skank." Those two tunes definitely stand out as the biggest tunes of that genre. ASTON HARVEY and Matt Cantor of FREESTYLERS fused electro sounds with funk and hip-hop to create their take on the big beat sound. Their last album, Adventures in Freestyle, was released in 2006. Big beat helped propel electronic music in America. The music that turned me on to big beat was Chemical Brothers' "Song to the Siren." At the time, dance music had run itself up an alley, with the 4/4 beat and the cheap, cheesy vocals. It had just run its course for me. And I heard this Chemical Brothers (then called Dust Brothers) track at the time, and it just blew my socks away. It was like hip-hop meets dance meets electronica and with the beats ... it just totally and utterly changed what I wanted to do and the direction I was going in. Suddenly, that was what I wanted to do. BARRY ASHWORTH worked with Jon Carter on the first MONKEY MAFIA big beat song, "Blow the Whole Joint Up." Together, they were one of the first groups to drop a big beat record just after The Chemical Brothers started the style. Carter and Ashworth split up right after the recording, and Barry formed DUB PISTOLS. Dub Pistols just released a remix collection called Rehash. I would pick "Take California" just because — even now — it has so much energy. And it's one of those tracks where, when it was played, the dance floor just went crazy and you could see people with smiles on their faces, fists up in the air, just going crazy for it. I used to go to this little club night in London with [Wall of Sound founder] Mark Jones on Sunday nights called the Heavenly Social. They had DJs such as The Dust Brothers there, who are now called The Chemical Brothers, and Jon Carter. They played a mixture of hip-hop, techno and indie rock like Primal Scream and Oasis. It was this eclecticism of different forms of music all heard in one night that grabbed the imagination of quite a few people around that time in the U.K.
ALVIN COLLINS has been with the record label Wall of Sound since a few months after it was founded by Mark Jones in 1994. Acts like Propellerheads, WISEGUYS and LES RYTHMES DIGITALES were signed in the early days, and the series of compilations called "Give 'Em Enough Dope" made a name for the label and for the style big beat. In '97 and '98, Wall of Sound had a run of chart hits including Propellerheads' "History Repeating" and Wiseguys' "Ooh La La." I think big beat peaked with the song "Private Psychedelic Reel" by The Chemical Brothers, when there was still amazing creativity going on. Real efforts to make something different, not just use obvious samples. The Beatles' record company went for them, thinking they'd sampled the Beatles. They'd just layered so much to get the sound like that. The Beatles had their musicologist all over it. That's how intensely worked upon it was. It's got the magic of being really uplifting, yet taking such old influences, being progressive and pushing it forward. And also putting real soul flavor and a good quality of darkness into an instrumental track. Alongside Death in Vegas and The Chemical Brothers, JON CARTER was an original resident DJ at the Heavenly Sunday Social party, which began at the the Albany Pub in 1994. Carter brought a real eclecticism to big beat — his group MONKEY MAFIA was known for its dancehall and Jamaican soundsystem grooves. Monkey Mafia has a full-length album due out next year. The one that I latched on to most, that I've always loved, is a David Holmes track called "My Mate Paul." It's a really simple tune, just a real nice funky breakbeat and some nice samples and a big deep sound and quite cinematic. It's got this huge sound, big rolling reverb-y sounds, but with a very nice, tight beat holding it all together. And it's very loose, and you can mix things in and out of it. It's just got great energy. It's definitely one that helped focus me into doing the writing that I did. Up until then, if you were playing a techno set and you dropped in something unusual, people would look a bit annoyed. But on the big beat nights, people were really up for it. It was an eclectic approach to music, less self-conscious, less style-conscious — a little more alcohol-fueled, as well. The scene before that had gotten very serious, and we were all about just laughing and making a fool of yourself and not being afraid to do that. ALEX GIFFORD formed Propellerheads with partner Will White in 1995. There was actually an American label called Big Beat. It had tracks by Nubian Crackers, instrumental hip-hop stuff which we used to speed up. It was quite an influential record, from New York. It was all about the breaks and the drums, actually. It's for people who just like listening to drums. I used to play a set of instrumental hip-hop back when I ran a club. We'd play just those pure New York break records. We were quite inspired by the New York stuff. We'd speed the record up and mix it up with samples from beats and pieces. Albums, rock stuff like John Cougar Mellencamp's "Jack and Diane," that kind of stuff. The Who's "Can't Explain," the guitars from that, Nirvana, reggae ... out of that came the scene. MEKON, a.k.a. John Gosling, was one of the original big beat artists signed to Wall of Sound. He's credited with providing the blueprint for the genre later made famous by The Prodigy and The Chemical Brothers.